Do you like Shoot N Scroll 3D? Share it with your friends. Shoot N Scroll 3D is a deluxe air shooter in which a total of ten differently challenging levels are ready for you and can be played by up to three players at one computer at a time. Before each round, select one of the three helicopters and then hit the game. 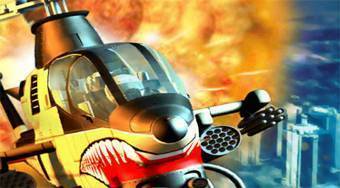 Pilot the helicopter, fly over the sky, shoot enemy airplanes, use special attacks, and try to fly all the way to the finish.